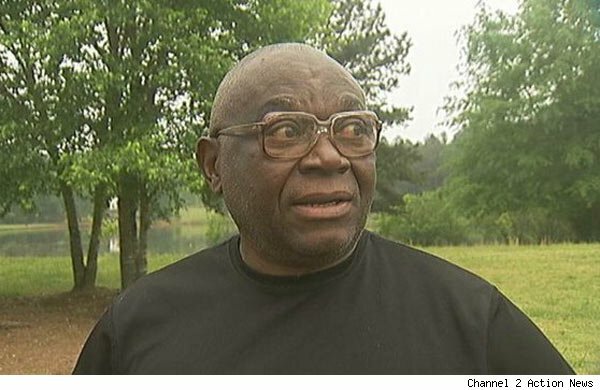 When Robert Canoles and his son Branden saw two people trying to enter the foreclosed and empty home next door to them in Porterdale, Ga., they were quick to react. 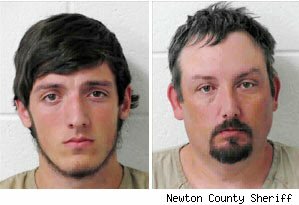 They held the unknown visitors at gunpoint, and waited for the Newton County Sheriff's deputies they'd summoned to arrive. The officers quickly arrested the strangers, charged them with loitering and prowling, and praised the Canoles for their actions. 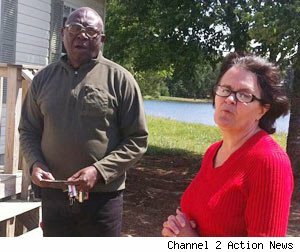 But Jean-Joseph Kalonji, 61, and his wife Angelica, 57 (pictured) weren't prowlers. The couple's son had recently purchased the home in the small town about 35 miles east of Atlanta, and they were there to change the locks before moving in. After the Kalonjis' son, Bruno, was able to provide the documentation proving ownership of the property, the charges against the two were dropped. "I cannot believe that six cops ended up here and none of them wanted to investigate the situation a little more," Bruno Kalonji told Atlanta's WXIA-TV. "They're looking at my parents as thieves at a home where there's nothing inside." In a complete 180, police have since arrested the Canoles (whose mugshots are below) and charged them with aggravated assault, false imprisonment and criminal trespass. The Kalonjis' attorney, Don Samuel, expressed dismay with the police officers' initial response. "They just spontaneously arrested him, arrested his wife, threw them in jail, made no phone calls, made no effort to verify the truthfulness of what they were saying, and told the people with the guns in essence, 'Thank you for your good service,' " Samuel told Georgia TV station WSB. The deputies who arrested the Kalonjis are facing an internal investigation. But perhaps the Canoles and the police weren't wrong to at least be suspicious. Squatters breaking into and occupying foreclosed houses are a real and widespread problem. Just last week, the occupants of a foreclosed home in Antioch, Calif., filed a case against a real estate agent who is trying to sell the house. They issued a temporary restraining order, making it illegal for her to be within 50 yards of the property. The purported squatters "never ever paid my client," real estate agent Melissa Case explained to KTVU. "Actually, the police came out and verified that their rental agreement is false and filled with misspellings." • It was reported last month that a tax-aided New York City homeless advocacy group has been teaching homeless people how to squat in vacant properties. • Alleged squatters in Miami were found with drugs, handguns, grenades, and a pig. • A huge marijuana growing operation was discovered in a vacant, foreclosed house after it caught on fire in Reche Canyon, Calif. And there are reports of even more foreclosed homes are being turned into pot gardens. • In Fort Worth, Texas, a man claimed a vacant $2.7 million mansion as his own. And another wrote an e-book about how to possess an empty house by exploiting an obscure Texas law, but was later kicked out of the foreclosed dwelling that he claimed as his own. Jim Marek says the quiet streets and friendly vibe of Merrimack Mill Village remind him of the working-class neighborhood where he grew up, in Chicago. That's why he jumped at the chance to buy a well-built fixer-upper here, at a pretty great price. "If you're willing to invest the sweat equity, you can have a nice home," he says. As the center for propulsion research for NASA and the U.S. Army, Huntsville is nicknamed The Rocket City, but for much of the last century, cotton manufacturing was the focus of the local economy. At its peak production, in the mid-1950s, the Merrimack Mill employed about 1,500 people, out of a population of just 25,000. "It's remarkable how many lives this neighborhood touched over the years," Marek says. Merrimack Mill Village, with nearly 300 structures built for the mill's workers in the first half of the 20th century, was added to the National Register of Historic Places in 2010. Most of the houses are simple wood-frame cottages or side-by-side duplexes that can be converted into single-family homes. A one-story, 1,200-square-foot fixer-upper cottage starts at around $40,000. A 2,200-square-foot duplex costs around $80,000. Merrimack Mill Village is about a 10-minute drive from both downtown Huntsville and the Cummings Research Park, so commuting's a breeze. Aside from rockets, the medical and life-sciences industries are booming here, and new jobs are pouring into town. In 2009, Huntsville was named America's best city to live in by Kiplinger's magazine. It seems like rockets aren't the only thing taking off in Huntsville. Among the best for: The South, Fixer-Uppers, Bargains, Easy Commute, American Heritage. See home listings in Huntsville, Ala. Situated around a small but beloved pocket park, this Long Beach community of about 22,000 is catching the hearts of artists, musicians, and young couples, some of whom migrate about 25 miles south from Los Angeles for its character-filled Craftsman bungalows and Spanish Revivals, as well as its proximity to the coast. The neighborhood developed in the early 20th century, when second-generation British and Scandinavian immigrants, who worked in commerce, the shipyards, and the oil fields, purchased individual lots to build modest, largely two-bedroom houses. Nowadays, it's a hipper, expanded version of Mayberry, a place where locals gather in the park for picnics or yoga classes and where impromptu concerts might break out on porches on summer nights. Rose Park is also adjacent to Retro Row, a three-block commercial strip that's home to pubs, shops, and a restored 1920s Art Deco movie house. The oldest are Victorian-era cottages, but the most ubiquitous are Craftsman bungalows, all the rage between 1910 and 1922, when the neighborhood saw its boom. Later styles include Spanish Revival and Mission Revival. The average price is around $350,000 to $450,000. The 2008 restoration of the neighborhood's namesake park has given new life to this area, notably in an annual bluegrass festival that draws thousands. And if you're a DIY novice, The Rose Park Neighborhood Association hosts an annual Restoration Trade Fair each summer, when dozens of craftspeople and contractors advise visitors and attendees on the best practices for restoring their old houses. Among the best for: The West, City Living, First-Time Buyers, Fixer-Uppers, Walkability, Lots to Do, Cottages and Bungalows, Editors' Picks. See home listings in Long Beach, Calif.
From the Tudor Revival commercial buildings downtown to its stone pathways and tennis club, Avondale Estates has the unmistakable feel of a storied English village. And that's no accident. After visiting Shakespeare's birthplace of Stratford-upon-Avon in the 1920s, founder George Francis Willis commissioned internationally known city planners, civic engineers, and landscape architects, including Philadelphia landscape architect Robert Cridland, to turn what was once a small farming community into a Peach State version of the Bard's hometown. Nowadays, this small city of about 3,000 draws new residents with its lush, undulating landscapes, pocket parks, and its centerpiece, Lake Avondale, which offers fishing and an enduring sense of tranquility. The English Tudor style predominates among the assortment of English Cottage, Dutch Colonial, Colonial Revival, and Craftsman homes. Most are from the 1920s, though there are several ranch-style houses that were built beginning in the 1950s. Look for thoughtfully crafted details including elaborate brick or stone work, decorative brackets, or red tile roofs. Fixer-uppers start at $120,000, while thoughtfully updated larger houses run from $200,000 to $500,000 to a high of $700,000. Despite its quaint village atmosphere, Avondale Estates is just a few minutes from downtown Atlanta, by car and two rapid-transit stations. The city's own downtown area is a quick walk and features many restaurants, pubs, and specialty shops owned by residents. Two high-performing charter schools draw families, and the spacious backyards and pocket parks appeal to kids and parents alike. Among the best for: The South, Easy Commute, Fixer-Uppers, Small Towns, Family Friendly, Parks and Recreation, Walkability. See home listings in Avondale Estates, Ga. Some of our favorite old-house neighborhoods are found in the Hoosier State. And the West Washington neighborhood of South Bend is no exception. Here you'll find solid, beautifully crafted homes set along tranquil sidewalks that'll get you to downtown South Bend's restaurants, museums, and shops in no time flat. West Washington was once the city's most affluent neighborhood, a place where the founders of companies such as Studebaker and Oliver Chilled Plow built lavish mansions. Those mansions still stand, but these days, the neighborhood is affordable to Midwesterners of more modest means and is home to professors from the nearby University of Notre Dame, as well as doctors and young professionals. West Washington has been on the National Register of Historic Places since 1975. Local and nationally recognized architects, including John Mills Van Osdel and, in one case, Frank Lloyd Wright, designed the buildings and houses here. Styles include Federal, Queen Anne, Greek Revival, and Richardsonian Romanesque. Fixer-uppers can be found for as low as $70,000, but a restored 6,460-square-foot, 7-bedroom Queen Anne mansion was recently on the market for $595,000. The average price for a home runs around $250,000. While the 1970s ushered in a period of decline, for many years, the neighborhood's close proximity to downtown and Notre Dame has led many old-house lovers to restore its decadent dwellings, turning houses formerly carved into apartments back into single-family homes. Across the Ohio River from downtown Cincinnati, the East Row Historic District was once home to late-19th-century riverboat captains and captains of industry, including brewers and bankers. When river-based industries declined, Newport took an alternative approach to diversifying its economy, as casinos, saloons, and houses of ill repute turned this into the Boardwalk Empire of the South. The 1980s saw an influx of architects, doctors, and young professionals restoring East Row residences that, despite being divided into apartments or boarding houses, retained many of their original details. These days, the neighborhood continues to draw Cincinnatians and fans throughout the region who appreciate its river-town beauty, entertainment district, and the beloved Newport Aquarium. Many of East Row's 1,100 houses were built by 19th- and early-20th-century German craftsmen who came to work in the breweries and trades of this region. Houses feature ornate metal cornices, stone windowsills, stained-glass windows, and the occasional turret. Since they were erected primarily in the Victorian era, Queen Anne, Second Empire, and Italianate styles predominate. While some homes are priced above the $300,000 mark, you can still get a more modest dwelling or fixer-upper for just over $100,000. Newport's entertainment district provides plenty of places to eat, hear music, or grab a drink. Cincinnati is easy to get to, thanks to a recently restored pedestrian bridge that allows you to walk or bike downtown for work, dining, or a Reds game. Among the best for: The South, Bargains, Fixer-Uppers, Lots to Do, Easy Commute, Walkability, Waterfront, Victorians. See home listings in Newport, Ky.
Sarah and William Curtis might hardly recognize the farmland they cleared along the Stony Brook River in 1639. Back then, the area now known as Jamaica Plain was located in the town of Roxbury and was largely a pastoral paradise dotted by family-owned farms. By the 1700s, new roads, including the Dedham Turnpike, led wealthy Bostonians, including Massachusetts governors John Hancock and Samuel Adams, to build estates here. By the time the railroad arrived, in 1834, Jamaica Plain was an affluent suburb. These days, the 4.4-square-mile area is known for its stellar housing, its thriving Latin Quarter, and its large population of artists, young professionals, and students from Northeastern University and other nearby colleges. It's also home to funky shops, amazing restaurants, and one of the oldest Irish pubs in all of Boston, Doyle's. Most date from 1840 to 1900, a time when railroads and streetcars first made it possible for commuters to live here. Styles include Greek Revival, Stick, Queen Anne, and Italianate. There's also an ample supply of Boston's legendary three-decker houses, which have been turned into condos, starting at around $199,000. Houses run from about $360,000 to the millions. Located six miles from downtown Boston, Jamaica Plain retains some of the bucolic atmosphere it enjoyed in Sarah and William Curtis's day. Bordered by the Arnold Arboretum, Jamaica Pond, and Franklin Park—all of which were designed in the late 1800s by Frederick Law Olmsted—it's known as the greenest neighborhood in Boston. Among the best for: The Northeast, Lots to Do, Easy Commute, American Heritage, College Towns, Fixer-Uppers, City Living. See home listings in Boston. Encompassing 30 blocks of hardscrabble North Minneapolis, this Victorian-era enclave is the kind of place where people fall in love first with a house, then with the neighborhood. "This area has always been stigmatized as a rough part of town, so it wasn't on my radar," says resident Amy Narum, who moved into her partner Mary's 1904 duplex a few years ago. "But I quickly realized that people here are really friendly and really close." The area, named for its location high above the city's Bassett Creek and Oak Lake, was largely developed during the 1880s, when architects designed residences for well-to-do merchants operating businesses along its main thoroughfares of Washington, Plymouth, and West Broadway. Middle-class migration to newer suburbs, combined with absentee landlords, put the neighborhood on the decline by the 1970s. But residents fought back, forming a neighborhood association that's the basis of the tight-knit community. Most are 2,500- to 3,000-square-foot Queen Annes, Prairie-styles, and Craftsmans constructed from the late 1800s to early 1900s. While prices for restored houses were reaching the $300,000 range during the housing boom, you can now get one for as little as $150,000, while fixer-uppers can be had for as little as $40,000. Absentee landlords who'd scooped up properties in Old Highland during the real-estate boom are largely out of the picture, resulting in housing stock that's well-priced, lived in by locals, and much better maintained than it was before. Because of the low prices, many homeowners here are purchasing properties on their own blocks and restoring them for use as rentals. Among the best for: Victorians, Editors' Picks, The Midwest, Fixer-Uppers, First-Time Buyers, City Living. See home listings in Minneapolis. To see the rest of the Best Neighborhoods for Fixer-Uppers, check out This Old House.